IAM Engineer Blaine Keys, left, buys produce from Suzi Gibson, owner of Bowensville Farm and Nursery in Prince Frederick, MD. 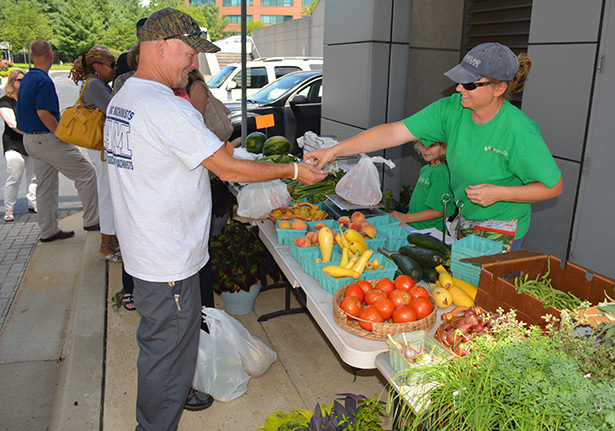 To support local agricultural products and to highlight the benefits of buying products from area farms, the IAM Grand Lodge hosted a local farmers market this week in conjunction with Maryland’s Buy Local Challenge. Employees were able to purchase fresh fruits, vegetables and plants directly from the growers. Why buy local? It’s good for you, the local economy and the planet. In addition to providing food that’s fresh and nutritional, buying from local farms promotes cleaner air and water and reduces our carbon footprint. In Maryland, if every household purchased just $12 worth of farm products for eight weeks, over $200 million would be put back into the pockets of farmers.